Tsubasa Kazanari and Kanade Amou—the idol duo known as Zwei Wing—use their songs to power ancient weapons known as "symphogears" to combat a deadly alien race called the "Noise." While the general public is aware of the Noise's existence, knowledge of the symphogears are kept a secret. 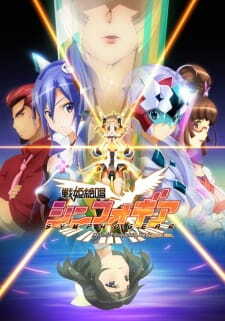 When the Noise attack one of Zwei Wing's concerts, Kanade sacrifices herself to protect a young girl named Hibiki Tachibana, leaving Tsubasa devastated and a fragment of her symphogear embedded within Hibiki. Two years pass and Hibiki is once again dragged into a Noise attack. While rescuing a young girl who has been left behind during the evacuation, she awakens the power of Kanade's symphogear lying within her. Although Tsubasa still grieves over the loss of Kanade, both girls must now learn to work together using their powers to defend humanity against the Noise. If you hate inconsistencies, stupid plot devices, a horribly flawed setting, and poor characterization, Senki Zesshou Symphogear is your worst nightmare. The start of the series is deceptively good, we see a concert that's animated brilliantly, and we have a seemingly gritty story; we witness Kanade die in the past, and Miku crying over Hibiki's grave in the future. This image the anime painted itself in the first episode is one of the greatest deceptions I've witnessed in any form of media. After the first episode, the animation quality drops dramatically, at times you wonder how the producers thought they could get away with it. Epitomizing this is a scene as early as episode 3 where Tsubasa is walking along the corridor with her manager, which looks like a GIF pasted on top of a moving background. It's obvious that they spent most of their budget on the first episode, leaving them to cut back as much as they could throughout the rest of the series. By the end they managed to get a more acceptable level of quality, which was consistent for the rest of the series, so happily it manages to avoid totally failing in the art area. The soundtrack is quite enjoyable, and goes some way to make up for the animation. The songs they sing as they fight are relatively good, and it can bring an atmosphere to fights that is otherwise missing. The Opening is fine and fits the series very well, but I personally preferred the ED, "Meteor Light" by Takagaki Ayahi. It took a while for it to grow on me, but it's a track that sounds dark and traumatic, which fits the atmosphere the series was originally aiming for. The characters are terrible, and the relationships they share change for the most bizarre of reasons. There's an instance where a character hates another one so much she's tried to kill her, but her hate is instantly forgotten when the other character points out her room is messy. Most of the characters are characterized very poorly, and the protagonist is very annoying. However, whilst this is the case, most of the cast is likable, and so you'll find yourself liking most of them, even as they go through the harsh character changes that the plot forced upon them. Unsurprisingly, the plot is also lacking. It's a very simple plot, the one plot twist the series has is so obvious that you can identify it 5 episode before. It's simplicity works for Symphogear's though, as it manages to avoid being too disastrous throughout most the series. However, in the final few episodes, it gets so ridiculous that you will be amazed. Stupidity like this is something that is rare, and therefore something to be treasured, as it will make you re-evaluate what you consider truly preposterous. The setting is also so tremendously flawed that whilst you can happily ignore it if you so wish, even minor probing will expose questions to which there are no answers. For example, with the frequent attacks by the Noise, which you cannot defend yourself against and kill everyone in the areas they attack, why do people go outside so casually? Much as I like the outdoors, I can't hep but think that I like living more. Also, much as I love my current house, if there was constantly the threat of death, I think I'd move. The inconsistencies are fairly easy to ignore, but if you think about anything in the series, you're likely to notice some. Take the Swan songs, they used to mean certain death, yet past Kanade's death, it stops being fatal, and towards the very end, there is no visible affect at all. This is of course because it was a plot device, but the unashamed way in which the anime casually allows these is dreadful. With this all in mind, this is a very bad anime. However, there is one thing that works in Symphogear's favour that saves it from the worst, and that is that it's earnest in it's stupidity. It isn't trying to be taken seriously, and it isn't pretentious, which means it is very hard to hate. The characters that I hated at the start of the series grew on me, to the point I liked almost all of them. Take the girl who's lines almost solely consist of failed meta-comedy attempts like "If this were an anime" which infuriated me at the start, towards the end I almost found her habits endearing. It's a strange quality of an anime like Symphogear, which is terrible, but still enjoyable to the extent where I looked forward to the last few episodes, to see if the episodes could outdo themselves in their silliness, but more importantly fun. So, if you are happy to ignore all that is wrong with this anime, then you will be able to enjoy it. Despite the amount that is wrong with this, it's all surprisingly easy to ignore. However, if you cannot ignore the technical details in anime, then avoid this like the plague, unless you wish to see how badly executed an anime can be. Since this was in storage for quite sometime I finally decided to watch, and finished this anime. This is pretty much action-y, but at the same time, it has a pretty deep story to it, and is kind of entertaining. For people that love action, I think you guys may or may not like this anime, since the action isn't really the main focus, cuz they focus more on the plot I would say.. Started of pretty good on how they kind of went to the future, and then goes back to what happen to get there, like a lot of anime I know. It moves at a good pace, and that's good since in my opinion it explained to me more about what's going on. Mostly this anime probably wants the watcher to be sad when they watch it, but it turns out to be a pretty happy story after watching all the episodes. They could make some more improvements on the way the made the characters, since in some scenes, after they got beaten up pretty badly. They came back fighting looking fresh as new in so little time. Of course, they have quick regeneration skills, but still I don't think it's suppose to be that quick. Sometimes, the motion when the character walks seems kinda unrealistic and that's, for me, a disturbing thing. Not bad at the sound. The pitch when the characters scream, sweep, or are cheerful is very good. The best part of the sound I liked is the part where they make the crying of some characters pretty short. In some anime they just made the crying very long, which is pretty annoying, maybe because they want to waste time cuz they can't think of anything. It's great to find anime were the character doesn't piss you off so much that you just wanna smash your head into your keyboard. The characters are well made. The way they act, and talk to each other seems pretty much like real life. On top of that, a character tries to make this anime sounds like it's really "not" an anime, and that it was real life for them. I don't really think I could say much, since I saw the rating on this anime, and it's not that good at all. For me, it was a nice experience watching this, and I don't really think a fan of a serious action would wanna watch this, since the action in this anime is not quite that great, and the moves the characters have are repeated a lot of times, and there a not a lot of new moves. I guess this is my final say on how good the anime was during my time watching it. This is, I think, a pretty girly anime.... I say that cuz of the not so violence parts ( even though there was a lot of blood ) in this anime. Maybe if they increased the intensity of the fights, that might have helped to give it a higher rating.. The high hopes I had for this series were dashed after the first few minutes. The storyline felt like someone decided to animate a fanfic for a much better series. There were these honest traces of something better in the storyline. It fell flat because of the cliches within the series and because of how much of a Mary Sue the main character is. In the first episode I was left asking why Hibiki was so special compared to all the other people who exist in this world. She's not special because she has any sort of talent, something she constantly admits. Her childhood is bland and uneventful, yet Kanade sings her Swan song in the first episode sacrificing herself just so Hibiki can live despite the fact it doesn't feel as if Kanade needed to sing her Swan song to save Hibiki's life. Instead, Kanade's death is simply a tool the writer used to give Hibiki her amazing powers so that she can be the heroine of the series. The theme of sacrifice is another place where this series falls flat. At the beginning of the series it is played up as being a very important theme but by the end it honestly feels like a joke. It is instead replaced by the theme that everyone can get along by everyone talking things out. Everyone else has a mind frame that violence will solve everything, but Hibiki is difference because Hibiki is so innocent and naïve that she honestly believes there is a better way when people are human. In the long run, it is Hibiki's character that destroys the storyline. Of course, Hibiki does have a few flaws up her sleeves to make the viewers not think she is a Mary Sue. She is at the beginning of the series horribly klutzy and she can't do anything right. This is fine when she first gains her powers because she has problems in her first fight. However, after this she receives no training from the government so she can fight the noise, she is allowed to run around on her own letting her klutziness in the way. Added to this, Tsubasa wants nothing to do with her because Hibiki reminds her too much about Kanade, and yet it would make more sense for Tsubasa to protect the one thing of Kanade she has left. Many of the characters don't get fleshed out and the way Hibiki gets over her flaw is just ridiculous. Her naivity also isn't played up as a flaw either, but it is actually her strong point as it allows her an innocent outlook on life that is willing to accept everyone who is human with no qualms what-so-ever. The art is really good and the sound is good at points, but they also like to play the main characters songs as being more special then anyone elses, including the other students from a music academy of all things. Have you ever looked forward to something that looks appealing only to be shot down? Have you ever seen a new series not based off anything else where it's simply stand alone and thought it would be good? I had these impressions only to be gunned down at point blank. One does not simply fail to execute new. Yes, I took that gag straight out of Mordor but seriously though. How do you fail to execute a rare or new idea? You make something like this, I myself thought this would have been interesting but was found on the wrong end of the spectrum. Essentially what we have here are robotic hybrids pummeling non existent creatures while singing extremely poorly. The pacing of the story jumps back and forth too often. It's just another one of those hero super power themes that the average fanboy/fangirl can add to their fantasies. An approach on the story is pretty poor, you get a glimpse of what happens from the beginning as we hear of misfortune and death. This high-tech organization forces artifacts onto young girls so they can transform into these robotic hybrids and fight the evil known as "Noise". That's the rare or new idea but its executed all wrong. The themes from the plot line like friendship and hard times are cooked over done so not even a bit of juice remains. It has a bit of government espionage but that's rubbish and over done as well. Now the art and music are more on the flashy side and distract quite too often, so much that I'm not really paying attention to whats happening. The art style is definitely flashy with the unique transformations that occur throughout scenes. Another thing that distracts me is the horrible English lines that are spat and literally translated so it makes virtually no sense. Stick to the Japanese guys, sorry if we butcher your Japanese but now we know how you feel. Another poor thing to point out would be the singing. Almost each and every one of these girls cannot sing worth a damn and its ear grinding to hear English verses. Now the characters are about generic as you come. The main heroines trying to save the world from evil is definitely not new by and aspect, look at things like Sailor Moon. The characters themselves almost have a shoujo-ai feeling to them and the hints are fairly obvious to anyone into the genre. The manly girl archetype isn't executed at all, they're still women even in their ancient suits of destruction. Not really any special characters that stick out in my mind. Realistically this failed to meet my expectations because I was somewhat looking forward to it. If you like girls beating things to a pulp though you might like it better than I did. Some series take time to get into. Not these ones. Whether there's some sort of disturbing violence or a profound life-changing event, these debut episodes make it easy to dive right in.